Having taken an unassailable 3-0 lead in the five-match series, India captain Virat Kohli said the team can afford to make changes in the playing eleven for the remaining two games against Sri Lanka. India played the same team for the first three ODIs, but are now likely to give players like Ajinkya Rahane, Manish Pandey, Kuldeep Yadav and Shardul Thakur a look-in in the last two matches. "We have a squad of 15, we will look to give some of the other guys a go. Having won the series already, we can afford to give those guys a go," said Kohli at the post-match presentation after India beat Sri Lanka by six wickets in third ODI, in Pallekele, on Sunday. 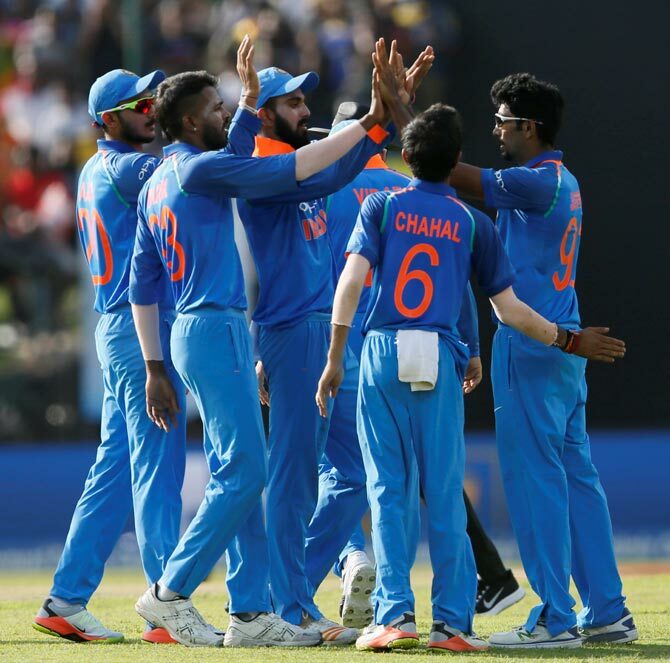 Chasing a modest target of 218, India felt the heat for the second game in a row after being reduced to 61 for four in the 16th over before Rohit Sharma (124) and Mahendra Singh Dhoni (67) guided India to a convincing six-wicket victory with an unbroken 157-run stand. Kohli, however, insisted that chasing smaller targets are not a problem for his side. "Small targets are always tricky. If it happens to you two or three times, I don't think it's an issue. Here the wicket was a bit more challenging. "The last game we had a collapse. The other batsmen really applied themselves. We have to be a bit patient with the younger players," said Kohli. He lavished praise on pacer Jasprit Bumrah, who picked up his maiden five-wicket haul which helped them restrict Sri Lanka to a below-par 217 for nine. "He has got 11 wickets in three games, he has bowled really well. Last game he missed out on a five-for, but he got it this time. He is doing a great job for us," Kohli added. Sri Lanka captain Chamara Kapugedera was unhappy with his team's batting performance. "I thought it was a good wicket, so we wanted to put on a score which we could defend. Things didn't go to our plans. We discussed about not playing dot balls in the middle. 260-275 would have been a challenging score," said Kapugedera.